Joss Whedon’s vampire with a soul is back. BOOM! Studios today announced the surprise debut of a new Angel series inspired by the television spinoff of Buffy the Vampire Slayer. Angel #0 by Bryan Edward Hill (Batman, American Carnage) and Gleb Melnikov (Saban’s Go Go Power Rangers) will be released exclusively to comic book stores on April 17th. 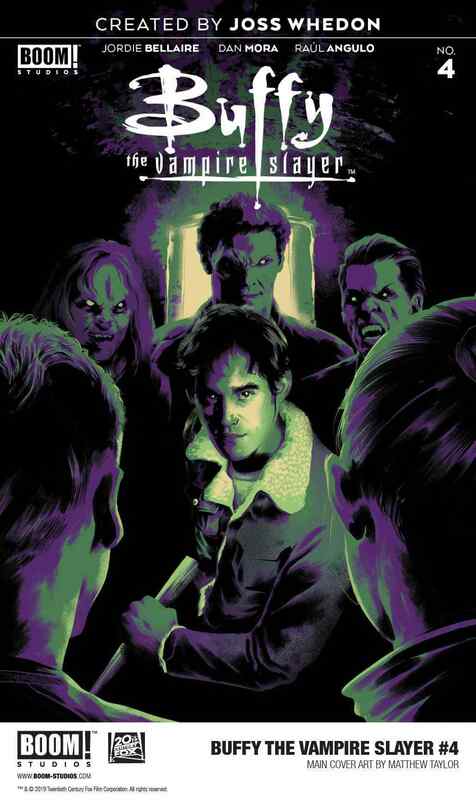 The series takes place in the same rebooted timeline as Boom’s rebooted Buffy the Vampire Slayer series, setting the new Angel series in the modern day rather than the 1990s. Angel will make his first appearance in this timeline in the pages of Buffy the Vampire Slayer #4, releasing on the same day as Angel #0. The character Angel was created by Joss Whedon for Buffy the Vampire, debuting in the first episode of the show in 1997 as played by David Boreanaz. In 1999, Angel moved to Los Angeles for his own spinoff series which ran for five seasons from 1999 to 2003. 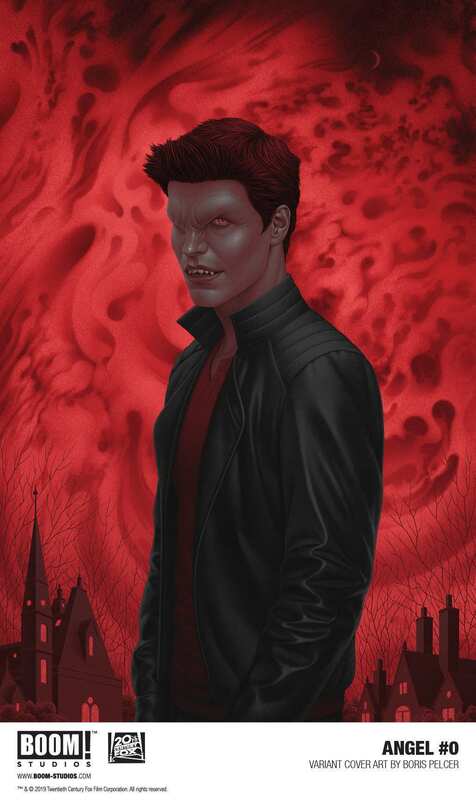 Angel lived for centuries as the brutal vampire Angelus until he was magically cursed with his own human soul. After that, he became Angel and began walking a more heroic path to try to atone for his past sins. ComicBook.com spoke to Hill, executive editor Jeanine Schaefer, and vice president of marketing Arune Singh about the surprise launch of Angel. Keep reading to see what they had to say. ComicBook.com: Why did you decide to go with a surprise launch for the new Angel series as opposed to the traditional solicitation process? Jeanine Schaefer: It was something that we talked about in our initial — We sat down we talked about, “OK, we know what books we want to do. We know that we're going to do an Angel book when we have Buffy.” Buffy and Angel are so intrinsically linked, but when we decided to do this kind of remix with Buffy, it really made us think about, well how can we introduce things in a different way? We don't have to introduce them exactly the same way as it happened on the original show. I really wanted to come up with this idea because we all knew everyone would be looking to Angel. When Buffy got announced, everyone would know that Angel was going to be hot on her heels. So, we decided, “Well let's make them wait for it.” Because I like to put the people that I love through maximum pain because I think that it's fun, and it has been really fun watching people wonder, “Where is Angel, where is Angel? He's my favorite, when is it going to come? I can't wait.” People love that show so much too. So we just wanted to put them through their paces and make them wait. I personally have been really enjoying the excitement that it's garnered, and I can't wait as we get closer to the actual drop date, to see what the reaction is. Arune Singh: The big reason we wanted to do this is, in addition to the creative reasons, was also they were really committed to driving customers to comic shops. We believe comic shops are a special place to discover comics. So that's why this is an event happening at the comic shop level, it’s a surprise drop happening there, and it's not going to be available even on digital channels for two weeks after this launches in comic shops. We wanted to make sure people were going to those stores to really be surprised again, because we feel like in this world of the Internet and the association, you don't have as many surprises as you used to have. Now that Angel is launching, how will the two series — Angel and Buffy the Vampire Slayer - and their main characters relate to each other? Are they going to be crossing over a lot? Are they largely separate? JS: Well I think we need them to establish their own identity first. I think we are really looking to give readers a new spin on their relationship, and an updated spin on their relationship. How each of them would be coming to each other in 2019 rather than in the '90s when the show first launched. So we are going to give them a little bit of time to breathe and please see my earlier response about liking to put people that I care about through maximum pain. I think that the waiting, to me, is the fun part. I think Bryan, that was something that we had talked about too. I think you are on the same page, right? Bryan Edward Hill: Well, yeah. What we want to do first and foremost is explore Angel as a character in his own space and add dimension that I think is there, contextually, if you look into the work that has gone before, but the beautiful thing in a comic book is you're unbridled from logic in a way. You can do things in a comic that's very difficult to do in television — I know because I also write television. So, we're taking advantage of our ability to do that. And obviously there's an inevitability to the meeting of these characters, but we wouldn't be doing our job as storytellers if there wasn't anything interesting afoot until they met. So, we're asking for a little bit of faith from fans — no pun intended — as we build the story, but we'll certainly travel through those threshold moments for sure. I'm excited about that, but I'm equally excited about delving into Angel's present in a new way and also exploring different aspects of his past. The elevator pitch metaphor for Buffy the Vampire Slayer has been “high school is hell.” I’ve always looked at Angel as a spinoff as extending that metaphor to say “adulthood is also hell.” What do you think is the essence of who Angel is and what his series stands for, especially not that it’s less entwined with Buffy at the start? BEH: Well, it's interesting that you mention that. I think about Angel as a character who is in this wilful extended adolescence in a way. It's like a melancholy Robert Smith adolescence. Robert Smith was the lead singer of The Cure for all the young people who have no idea what I'm talking about. They have a new album coming out in 2019; you should get it. It's really based on my experience as a teacher, because I was a teacher after I graduated college, and I was in the middle of my own early 20s maelstrom. But then we get around younger people, you have to make that decision, “Am I going to get over my own issues so I can help them through theirs?” I think that's part of what Angel's journey is going to be in the story. How do you save this generation from the things that are all coming together from the horrors of our own approach? So, we're going to be delving into, I think, things that are contemporary and relevant to what people in high school are dealing with. Social pressure, social media, self-judgment, isolation, loneliness, disconnection. These stories, horror in general — and I do look at Angel through a prism of thoughtful horror among other things — it always works best when it has an allegory; when it speaks to our reality in a heightened way that makes us reconsider that and Whedon’s work was ripe with that. Setting Buffy the Vampire Slayer, setting her in a high school, there's meaning to that. So that's what we're going to do. If you look at the body of my work, you'll see a lot of my stories are about purpose and redemption. More specifically, how can you turn tragedy, whether it's tragedy that you caused or tragedy that's following you, into something positive? So with Angel, we have an opportunity to show difficult steps of that journey, for him, as a character and that's exciting to me. As with the Buffy reboot, the new Angel series is set in 2019. There are some obvious ramifications there for Buffy and her friends because that means they grow up in a different era, but Angel is already hundreds of years old. How does being in 2019 instead of 1997 affect him? BEH: He's a character that's a living dichotomy, right? He is a character that can appear to be a certain age but is actually far older than that. That is a fascinating place for the character to be, because the way you would relate to him, without knowing him, is different than how you'd relate to him if you knew his details. A bad person, act his age and all that. So, those are the things that we're going to try and harness. It's still very much in the spirit of the character. It's really just a contemporary reinterpretation I think. So, for fans that are very familiar with aspects of this character, and they can expect those to be present, for fans that are unfamiliar they can get a reintroduction to Angel and his world, and there's a lot of surprises that we have in store because when you have that much life — life as a normal human, life as a villain. and life on the path of being a hero — there's a lot of stories there, and Jeanine and I spoke often about Highlander. I've been a very big fan of Highlander since I was a kid. In the way that you can weave in stories from the past or re-contextualize the present. So all of that is going to be active in the narrative for sure. Slide 5 of 7Angel the Loner? Despite Angel always presenting himself as a loner, part of the fun of the TV series was the great ensemble cast that built up around him. Will this series build up a similar cast, or will it lean more towards Angel’s loner persona? BEH: Well, here's the funny thing about self-described loners, right? Self-described loners are ultimately the people that do the most collecting of people around them. Bruce Wayne will tell you he's a loner, and he's got a large family of people wearing his symbol. Superman is the threatening one, kind of works by himself. So usually when someone is like that, what they're really saying is, “I'm not willing to put myself in the position to hurt or be hurt.” That's the approach I take with the character, and how a character can move through that. Whether it is by a choice they make, or by a reaction to a circumstance. I think a lot about how difficult it is to make real connections with people now. Angel, again, is a character that grew up in an age of parchment and firelight, when conversations happened in front of someone with eye contact. Now we live in an age where you can talk to many more people that you could ever talk to before, but you'll be in front of people far less. So all those ideas about what friendship is, what human connection is, and is this human connection? All these things, nothing really that feels very real. I think that's what people originally identified with, with the character, is this character that is, despite what he says, trying to figure out a way to relate to the world around him, and I think we've all been there at some point in our lives. When we spoke about Buffy the Vampire Slayer we talked a bit about how Dan Mora was perfect for the series because of his talent for drawing young people. What makes Gleb Melnikov the right artist for Angel? JS: There's a simplicity to his lines, but you can't stop looking at it. It's like he has all these amazing details but he does them very simply. I think that he's really great at setting a mood. He's really great at establishing his environment in the world and that's really what we need for Angel especially as we take this epic Highlander approach where each scene really needs to feel of its own full world, and he does such a great job of that. I mean, he also does really great with young people also. I think that's what's so important to this whole line is that it feels acceptable to young people in general and to newer readers, and still feel acceptable to loyal fans. I think he brings that same kind of energy that Dan does as well. Part of the fun of Angel was the way it would shift tones. There were a lot of serious episodes with Angel brooding a lot, but there were also episodes like “Smile Time,” where Angel is a puppet. Where should we expect this new series to fall on that spectrum? BEH: Well I think, tone for me is about reflecting whatever you believe is an authentic experience of the story, and life comes in many shapes. There are many colors in the rainbow of life, and I think, any time that you say, “Well, the tone can only be this,” or, “The tone can only be that,” I think you're restricting yourself in a way that I certainly wouldn't want to. If it's a forced brooding, then it feels inauthentic. If it's a forced camp, it feels inauthentic. Every story has its own kind of key, in musical terms. It has its own somber frame, its own melody. So, I would like to play with all of the notes on the keyboard at some point, just depending on where we are. There's certain qualities that Angel himself brings to a narrative that are interesting when pitted up against lighter qualities and sunnier things, and all of that. So, yeah you want to maintain that range of imagination that I think is part and parcel of Whedon's original work. JS: To add to what Bryan is saying, I think that's why I was so keen to Bryan, to have you on this project because I think you have a real understanding of how to be constantly balancing that idea that you need — you know, you can't have despair without levity and vice versa, right? It's not like, “OK, now is the time where we're having levity and now is the time we're having despair.” It's the constant balance of, from moment to moment, finding the peaks and valleys of that. I think that's something that Bryan is really good at. It's something that I think is necessary. I mean, for stories in general but especially for this universe, and it's something that I'm just really excited to see you do on the page. BEH: Well, thank you, Jeanine, I appreciate that. Like, the writers I admire are contemporary. People like Scott Snyder, Tom King, Gail Simone, Tini Howard. The beautiful part about comics is that comics are untethered from the hard and fast genre definitions that filmmaking and television can find itself kind of tracking. Comics for me have always been the place where you could get outside of the expected but still get a mythological experience. For people that are familiar with my work, they know that I’ll knock the tennis ball over the net and back again a lot. This is the nature of my imagination, so yeah. I think hopefully you'll be scared, you'll cry, you'll laugh, all that stuff, right? Because that's what we want to do as storytellers. Any last teases or message for fans? BEH: All I want to say is, I'm really excited to be able to do this, because Angel is one of my favorite works for an incredibly long time, and I never thought I'd be able to work with that character, and now that I am, I think fans are going to get a side of my imagination that I haven't been able to show people yet. I'm very excited to get the book in the hands of everyone and hear their reactions. Angel #0 and Buffy the Vampire Slayer #4 arrive in stores on April 17th.